Preheat the oven to 400°. Bring a medium saucepan of water to a boil. Add the couscous and a pinch of salt and cook, stirring, until al dente, 10 minutes. Drain well; let cool. In a bowl, toss the couscous with 1/2 cup of the chives, the mint, parsley, lemon juice and oil. Season with salt and pepper. Gently curl the salmon over the edge of a ceramic baking dish, skin side up. Make 5 or 6 slashes in the fillet about 1/2 inch deep. In a bowl, whisk the harissa, agave and the remaining chives. Rub all over the salmon and in the slashes; season with salt and pepper. 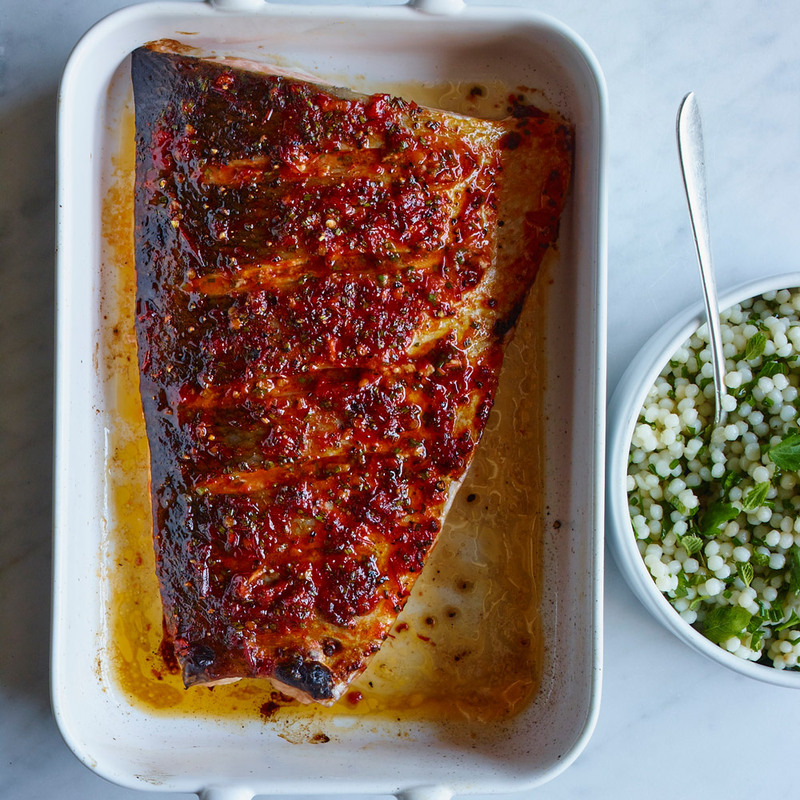 Transfer the fish, skin side up, to a foil-lined baking sheet. Roast for 8 minutes, until barely cooked. Turn on the broiler and broil for 3 to 5 minutes, until nearly cooked through and the skin is crisp. Cut the salmon into 4 pieces and serve with the couscous.